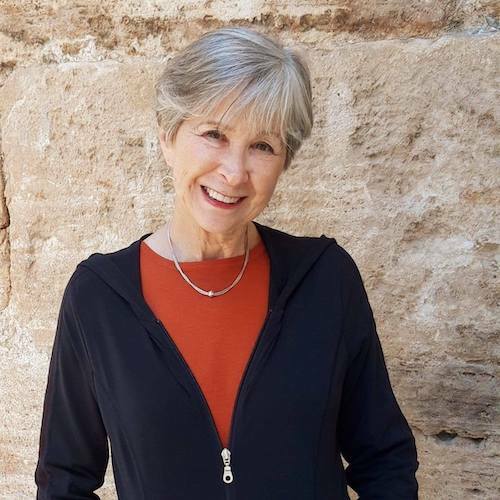 Whether you walk the Camino or not, Santiago de Compostela is big on amenities when it comes to lodging, restaurants, shops, and transportation. You’ll be joined by more than a million tourists who make their way to this small city of 100,000 residents. Pilgrims walking the Camino amount to only about 30 percent of those visitors. This small Spanish city is worth your visit and there’s much more to see than the myriad footsore peregrinos who limp into town each day. After we finished the Camino Inglés, we had three evenings and two full days in Santiago before flying back to Valencia. We filled our time with three of the following seven pilgrim traditions and enjoyed much needed recovery time as well. Do you want to be counted or not? Do you need their credential for proof? If your journey has been religious in nature, the Pilgrim Office in Santiago will review the sellos (stamps) on your Credencial del Peregrinos and provide you with a Compostelo (certification). If your journey was non-religious or non-spiritual in nature, you can still receive a Certificado (certificate) to acknowledge your pilgrimage. We collected sellos from cafés, bars, hotels and tourist offices along our way. The Pilgrim Office is open from 8 a.m. to 9 p.m. every day April 1 to Oct 31 and has reduced hours in the winter. The busiest times are 11 – 2. When we arrived at 3 p.m. there were a couple hundred people waiting in line. When we stopped in at 8:30 the next morning, the line was still 200 people long. Those poor pilgrims had much more patience than we did! And to think they may have stood in line at the alberques along the way to get a bed for the night too. We gave up on Tradition #1. Sadly, we won’t be counted. So, when they announced that 301,036 pilgrims received certificates in 2017, I wonder what the real number is. There must be thousands who, just like us, chose not to wait in line. The medieval cathedral (construction began in 1075) is not the most beautiful cathedral I’ve ever seen, but arriving in the plaza outside the cathedral (Praza do Obradoiro) with hundreds of other backpacking pilgrims made me feel humble and small. Pilgrim Masses occur everyday at 7:30 a.m. and 12 noon. I think it is a worthwhile experience, even if you aren’t Catholic. We took our seats at least an hour before the noon mass and by the time the Mass started every inch of standing room had been taken. Most people are impressed with the a huge (53 kg) censer made of silver-plated brass that swings like an enormous pendulum through the sanctuary from a height of 20 meters. It’s said to go up to 40 miles per hour and we were fortunate to sit where it swung right over our heads. The smoke and incense contributes enormously to a mystical experience today, however, swinging the botafumeiro had a more pedestrian purpose in the middle ages. The botafumeiro was created with such massive size in order to make the unbearable smell of the medieval pilgrims who were allowed to sleep in the cathedral just a little more tolerable. Botafumeiro aside, I was captivated with the voice of the nun who solo’d and led group singing throughout the Mass. The music stimulated yet another of my senses. I commented to Jamie that with a voice like that this nun could be a performer. Jamie observed that she already was performing. During certain times of the day, you can climb an area behind the cathedral altar to hug a gilded statue of St. James. Then stop by his crypt to view the saint’s relics. We were not in the cathedral during the hours for this activity so I didn’t get to see the line of pilgrims. I imagine there would be have been about 200 of them. I didn’t know the Peregrino Museum existed until we walked past its gift shop. I love museums and I was a pilgrim, so perfect. But dang, it was closed for renovations the days we were there. The online virtual tour shows a lovely museum with exhibit signage in English that explores the pilgrimage from the spiritual and physical points of view. Sounds like a quality museum. Remembering “the Marias'” a couple of resistance fashionistas. Alameda Park sits at the edge of the old town and if you haven’t worn out your feet by the time you arrive in Santiago, it is worth a stroll. There are some beautiful vistas and fun sculptures. Even if you’re tired and sore the “two Maria’s” sculpture is near the park entrance. These sisters were republican “leftists” during the Spanish Civil War. After the nationalists won the war, the sisters would dress up in outrageously colorful outfits and walk the park at 2 p.m. everyday. It was their quiet protest against the cultural repression of the Franco era. Santiago de Compontela is considered a gastronomic center for meat and seafood eaters. Unfortunately, we’re vegan. But, we weren’t left out. We found tasty non-Spanish food and many cute café’s. It is a delight to watch arriving pilgrims from the city’s cafés. We spent a good part of one afternoon in a sidewalk café along the Portuguese route doing just that. We were well rested by then but could certainly commiserate with them as we saw them trudging and limping into town. Just in case the experience was just too spiritual, the streets are lined with street vendors and shops filled with genuine scalloped camino shells, walking sticks, string bags, almond cakes (the Tarta de Santiago or St. James cake), almond cookies (Caprichos de Santiago), t-shirts, and mini botafumeiros. Everything a nostalgic pilgrim or pilgrim wannbe might need. 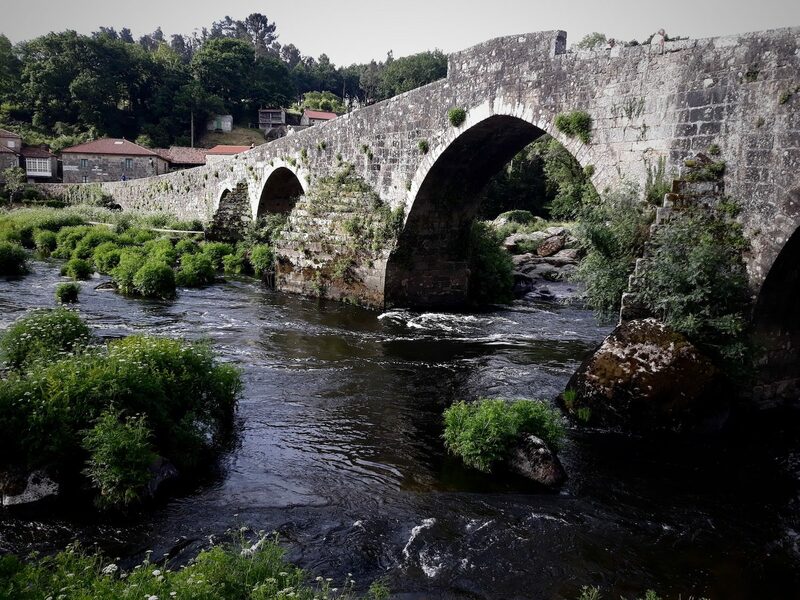 We chose experience over kitsche and booked a full day bus tour with Viator to see the Atlantic coast and the villages of Finisterre, Muros, and Muxia. We also were taken to the first and last stages of the Finisterre-Muxia Way – another 89 kilometer walk from Santiago that pilgrims from ancient times considered to be the end of the world. At Finisterre the intrepid pilgrims would burn their clothes or throw their shoes into the ocean to signify a new beginning. That practice is banned now but we saw plenty of evidence where it still happens under the cloak of darkness. I was not tempted. My hiking boots are too dear for such nonsense. Besides that, they need to take me on another hike real soon! We flew into and out of Aeropuerto de Santiago de Compostela, a modern and comfortable airport served by Iberia Air, Lufthansa, Aer Lingus and a handful of discount airlines, most notably Ryanair. 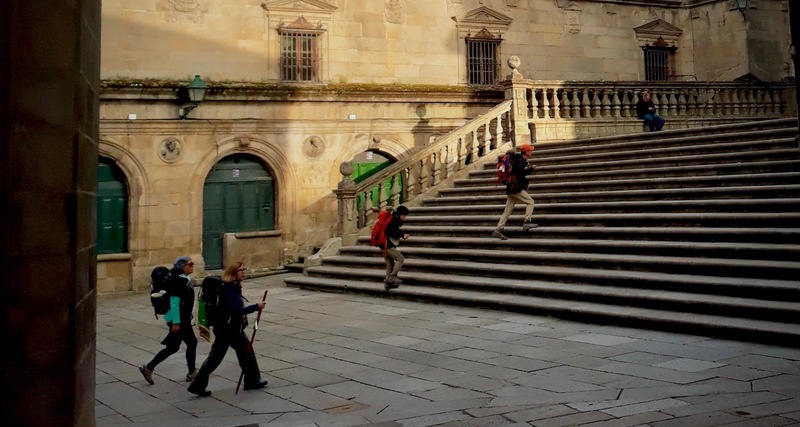 We caught a convenient twice-hourly bus to the RENFE train station via the city center and continued on by rail to Ferrol where we began our walk on the Camino Inglés. We stopped by the port city of A Coruña on our way, just to have a look. The bus, trains, and air transportation were all easy to use, inexpensive and had convenient schedules.